For anybody reading this blog from outside Edge Hill, we have a staff and student portal called GO. GO is intended to eventually replace the current intranet. For a while we’ve been working on a mega menu solution. 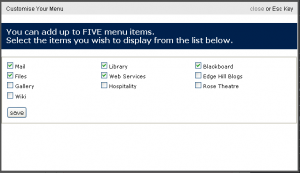 Mega menus are springing up everywhere and even Jacob Neilsen feels that they are a much better solution than previous drop down implementations. There are three features in our mega menus worth mentioning. 1. The mega menu content. There are two flavours of the mega menu, one for staff and one for students. External parties with access to go will not see a mega menu. The main mega menu drops down when the GO logo or the A-Z link is rolled over. The left hand colomn has some current news stories, and these will eventually appear automatically (they’re currently added manually so if they go out of date, bear with us). The other links have been deemed to have the most value and the A-Z link is repeated in the bottom right hand corner. Go on click a few and see where you end up. We have also added an A-Z page and this should cover all wiki pages sites for whom the user has access together with a few other areas of Edge Hill’s online services. 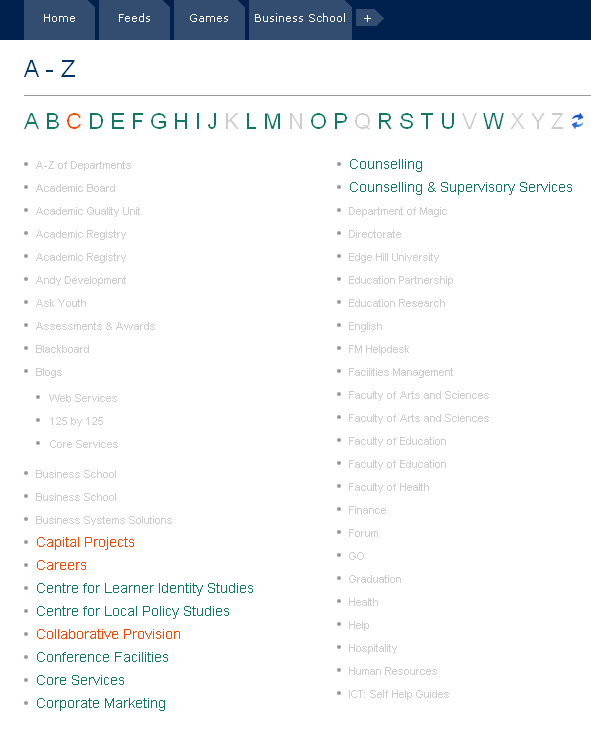 The A-Z is quite extensive so to enable easier access the A-Z has it’s own navigation. When one of the letters is clicked the items beginning with that letter are displayed and all others are greyed out making it easy to hone in the links you need. You may have noticed a +/- button on the top navigator. Initially all users are offered Mail, Library, Blackboard and Files on the top navigator. As long as the user is in GO, thay can use the +/- button to open a choice box and select the 5 items they prefer. There is scope to add further items in the future, but choices will be limited to 5 in order to keep the top navigator consistent. The mega menus should also function in the docs. library and wiki domains.